Workplace First Aid Guide Poster. User-friendly text and clear instructions show employees how to prevent accidents and injury whilst maintaining a healthy working environment. Durable laminated construction with full colour illustrations. Compiled by qualified health & safety practitioners. 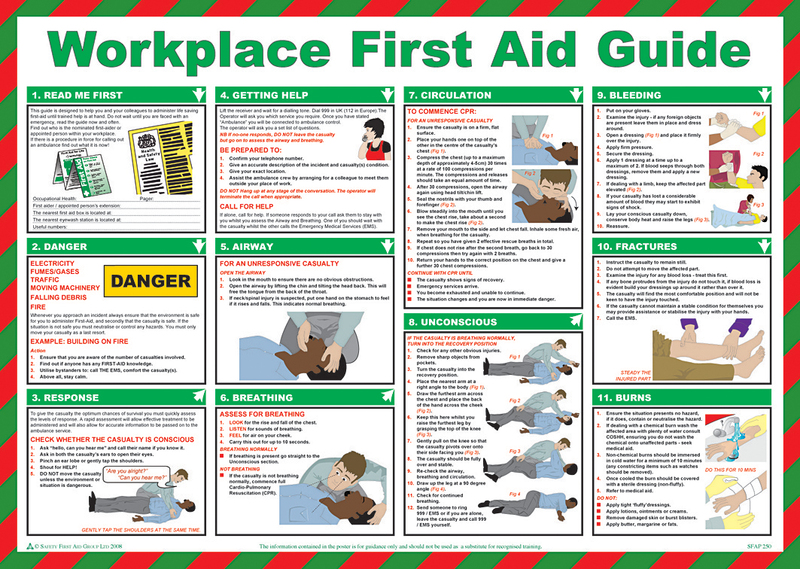 Sign Text: Workplace First Aid Guide Poster. Protect Your Employees And Avoid Costly Accidents. Signs in this range are from our maximum choice range. Giving you the most choice of signs available in the UK. Signs in this range are the most popular choices. We currently have more than 20 of this item in stock ready to be dispatched. This item is available for express courier delivery next working day. This item is available for express courier delivery next working day.